To learn how another person lives, walk a mile in his shoes. This is exactly what officials from the cities of Paynesville and Brooklyn Center recently did when they spent a day visiting and learning about the other city. Through the League of Minnesota Cities' "Walk a Mile" program, mayor Jeff Thompson, city administrator Steve Helget, police chief Kent Kortlever, public works director Ron Mergen, and city council member Jean Soine spent a day last month in Brooklyn Center - a city with a population of 29,000 - learning about the problems and issues faced by the larger city. In return, officials from Brooklyn Center visited Paynesville last week, where they gained insight on issues faced by small cities. "I really enjoyed it," said Myrna Kragness, mayor of Brooklyn Center. "It was interesting seeing how other cities operate." Brooklyn Center officials - including Kragness, city manager Michael McCauley, and police chief Scott Bechtold - were given tours of the Paynesville Area Hospital, the Lake Koronis Assembly Grounds, the Paynesville Area Historical Museum, and some local businesses before attending a city council meeting in Paynesville on Wednesday, Dec. 8. 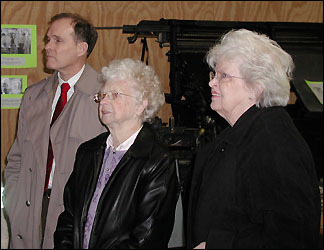 Retired curator Bertha Zniewski (center) give Brooklyn Center officials Michael McCauley and Myrna Kragness a tour of the Paynesville Area Historical Museum during their visit to Paynesville last week. While Thompson, Kragness, and McCauley agreed they weren't ready to take on the responsibilities of running cities so vastly different from their own, each had reasons to admire the other city. Kragness was impressed by how the cities were different, yet similar, she said. For instance, Brooklyn Center has the same size city council and faces many of the same financial problems, including previous losses in aid from the state. Because Brooklyn Center is much larger than Paynesville, it has more crime, and higher residential taxes - primarily because of the city's large commercial base - but it also has more grant money available for special projects, said Thompson. In addition, while Paynesville is a growing community with new development, Brooklyn Center has grown to its boundaries and its growth is concentrated on redevelopment, said Helget. Kragness was also impressed with the airport and the state-of-the-art facilities at the Paynesville Area Hospital. Brooklyn Center has neither an airport nor a hospital, she said. McCauley said he believes that Paynesville is fortunate to have a good working relationship with Paynesville Township. He pointed out that a good relationship with surrounding townships is something that most cities don't have. For Bechtold, spending the day with Kortlever was a real eye-opener. Bechtold has a much larger police force to supervise, with two stations (one near the local high school to deter crime there) and a holiday substation in a local mall, but he was amazed at how many hats that Kortlever wore as the chief of a small-city police department. The "Walk a Mile" program was implemented a few years ago by the League of Minnesota Cities. The program's goal is to bridge the gap between cities that are different because of size or economy, according to Thompson. Uniting cities was especially important when officials began to feel like cities were being pitted against each other to compete for state funding, added Thompson. If cities of various sizes show a united front, legislators may be less likely to do this, he added. Thompson acknowledged that Brooklyn Center had some facilities that he really liked. In particular, he was impressed by the city's community center, which houses an indoor pool, a gym, and meeting rooms. Such a facility would be nice to have, but Paynesville just doesn't have the tax base to support one, he said.